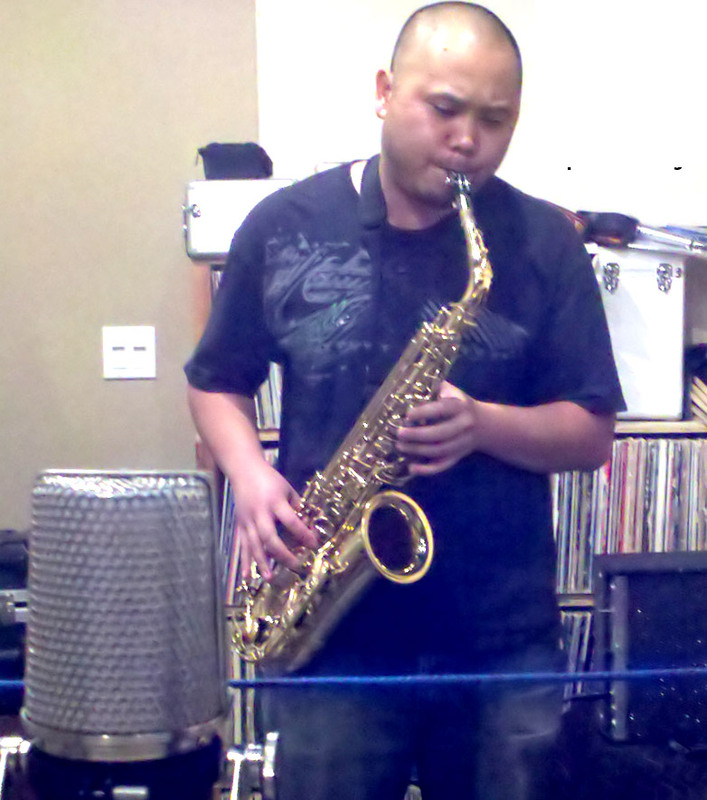 The sax session of our “$1k Ribbon Mic Shootout” was made possible by John Patrick Douglas, a wonderful musician who has played with dozens of jazz, classical and world music acts from the San Francisco Bay Area and beyond. John brought his alto sax, a 1959 Selmer Mk VI (Jody Jazz HR 6 mouthpiece, 3.5 strength Légère Signature synthetic reed), and the melody from My One And Only Love, and nailed every take. We’re in the midst of a “shootout” of six sub-$1000 ribbon microphones, about which you can read more in the introduction or this exhaustive lab test. See a full index of this test below. 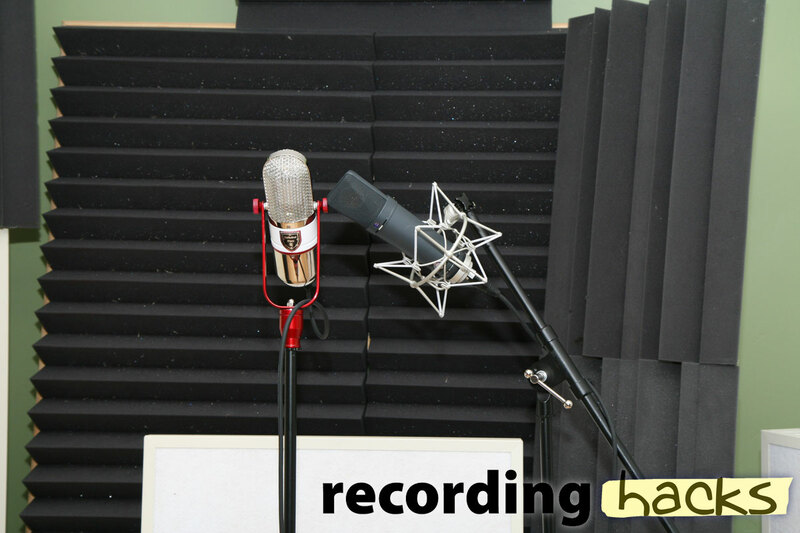 We recorded each ribbon individually, next to a 2013 Neumann U87 Ai as a control mic. 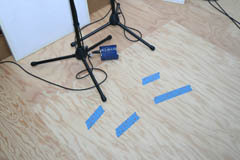 The microphones were set up 30 inches in front of a heavily treated wall. Because my studio is not quite finished yet (see the construction blog), it would have sounded overly “room-y” for this sax test. 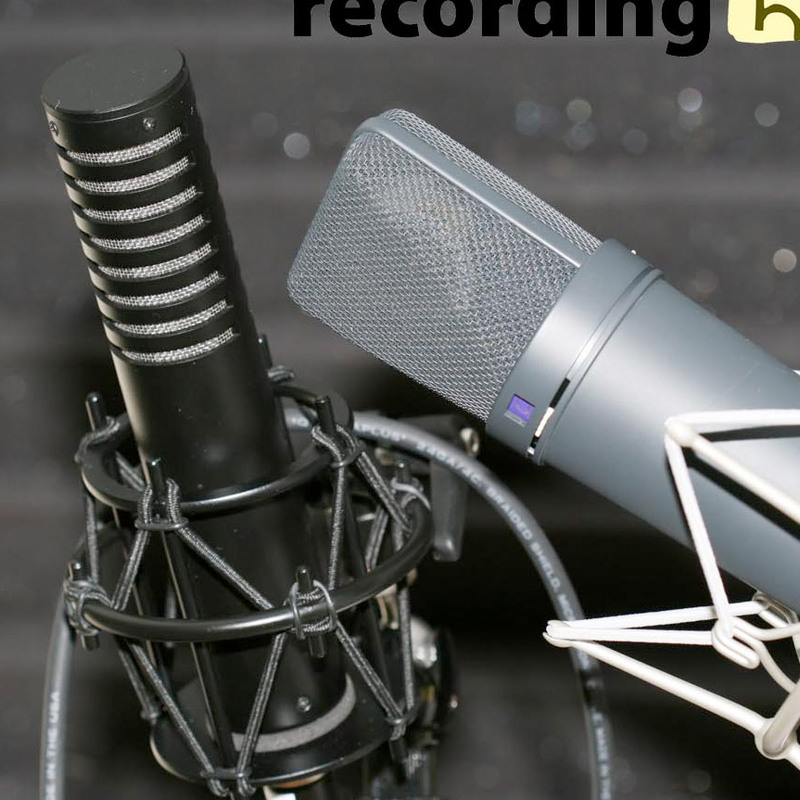 But I find it easier to focus on the tone of a microphone if the recorded track is dry and direct. Therefore, I covered one wall with acoustic treatment products: the top half of the wall was covered with a 4×4 foot panel of 4-inch Auralex Studiofoam, and flanked on two sides and above by LENRD bass traps. We stood a RealTraps Microtrap directly behind the mic stand, below the Studiofoam. The point of all this was to reduce reflections into the back of the mic. Remember, all these ribbon mics (like most ribbon mics) are bidirectional. John played twice for each mic: once at 18 inches from the mic, and a second time at 12 inches. We’d scribed tape lines on the floor to mark both foot positions. Mic position was kept very consistent: height, angle, distance from back wall. The mics were, in all cases, pointed at the upper half of the horn, at approximately the position of the left hand. The back side of each ribbon mic was pointed at a LENRD bass trap, approximately 40 inches away, wedged into the wall/ceiling junction behind the mic. Passive ribbon mics were routed through a Cloudlifter CL-2 (click for our review) into a BLA-modded Digi 002 Rack. Active ribbons were plugged into the 002 Rack directly, without the Cloudlifter. We used the clock and converters in the modded 002 Rack, and recorded at 24 bit, 48 kHz. The same input channel and cable were used for all mics (active and passive). The high-pass filter on the input channel (-12 dB/octave @ 75Hz) was engaged for all tracks. We set preamp gain for each mic individually, to deliver relatively consistent input levels into Pro Tools. After the session, I used RMS gain-matching to set equivalent levels for each clip. The use of RMS gain-matching can yield differences within arbitrarily selected passages, because the RMS approach matches the overall level of the clip. Should you find yourself comparing short sections within these clips, we advise matching levels for those specific sections first. WAV files were output from Pro Tools at their native resolution (24/48), then converted to high-bitrate MP3 via Sample Manager (click for my glowing review of same). Listen with good headphones, or you’ll probably miss most of the subtleties between these tracks. Click the button at the bottom to reveal which mic made each track. Note for people inclined to send me hate mail about how terrible MP3s are: see the link below to the 24/48 session file. My first test was to listen for a difference between the 12-inch and 18-inch tracks. I didn’t hear any changes significant enough to write about. Even the AEA N22, the mic that loves to be close to a source, sounded very similar at both distances. Perhaps it would have sounded more different at a much closer distance, say 6–8 inches, but that seemed an uncomfortably close mic placement for a relatively loud sax. So, the notes below are based on primarily on the 18-inch tracks. I’ll spare all suspense and say right here that all of these ribbon mics sounded good on John’s sax. I preferred all of them to the U87, in fact; the condenser accentuated valve noise, breath noise, and sometimes an upper-mid honkiness that doesn’t flatter the horn. In some passages, the U87 sounds like we’d multitracked a “breath” source; the wind noise rides distractingly on top of the tone of the horn. All the ribbons sounded smoother and more musical; choosing among them is an exercise in hair-splitting among subtle coloration changes. Part of the reason for this, I suspect, is that this horn on this track is mostly active between 200Hz–5kHz — a range where all of these microphones have a fairly similar response. But we’ll get more into the subtle distinctions as we go along. The AEA R92 sounds smooth and rich. That’s true for both the front and rear sides, which to my ear sound the same on this track; you could punch in one for the other and I wouldn’t hear the change. Both sides sound good. I’m not missing anything from either of these tracks. There’s no low-frequency buildup from proximity, and I’m definitely not wishing for more 8–20kHz. In the 18-inch tracks, the Royer Labs R-101‘s front and rear sides present more of a difference from each other than I hear from the two sides of the R92. In fact, when I ran a frequency analysis on these two audio tracks, I got graphs back that looked just like my sweep test — namely, the front side had an ~8dB dip around 12kHz, followed by a boost above 15kHz. On this set of tracks, I preferred the rear side of the R101 to the front. The front side sounded a bit reedier, and at times a bit strident. The rear side sounds smoother and more homogenous. Both sides of the R-101 have more presence at 2–5kHz than the R92, and less top end (8–15kHz). It is a subtle difference, though. And I give this mic credit for capturing the least valve noise of any of the mics. The AEA N22 sounds very close to the R92, which is to say, smooth, rich, and musical. Upon very close listens, the N22 sounds a tiny bit thinner, presumably due to its intentionally rolled-off low end. This is not a fault, though; I’m not sure how much 100Hz an alto sax track would actually get in a finished mix. The Samar Audio Design AL39 is not audibly different from the R92 in frequency response; like the R92 (and N22, and R-101 rear side) it captures a very nice, balanced tone from John’s sax. But at times it seems a bit more present and focused than some of these other microphones. For example, on the intro, the N22 sounds like it is farther away, despite having a higher RMS level. I can’t say that John was leaning in or out slightly for this or that track, but I can say that the AL39 sounded like it was closer. I’ve saved the brightest and darkest mics from our collection for last. 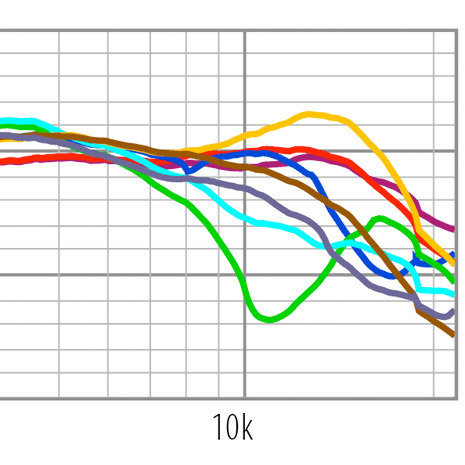 The Mesanovic Model 2 has the brightest response, 3–10dB above the rest in the 10–15kHz range. But we know this sax starts to roll off well below this point — closer to 5kHz. Does the Model 2’s extended high-frequency response make an audible difference? I would say that it does, in ways both expected and unexpected. It occasionally captures more valve noise as compared to the other ribbon mics. That effect is more apparent in the 12-inch track. And at times, the Model 2 track seems to contain more of the sound of the room. There’s more ambience to this track than I hear from the other microphones, as if there are high-frequency reflections happening that the other mics just don’t pick up. The Cathedral Pipes Seville is in many ways a contrast to the Model 2. It has a more attenuated high-frequency response, and the biggest subsonic response, giving it a decidedly vintage vibe. 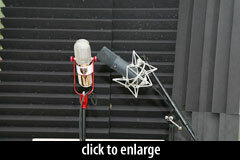 It comes across as a bit veiled in comparison to the other mics here, especially the more open-sounding models. It has great tone, though, and as are the rest, is much smoother than the U87 (which sounds almost ragged and harsh by comparison). I think it would be hard to go wrong with any of these as a sax mic; a bit of EQ in the DAW and you could make any of these mics sound damn close to any other. If I had to pick favorites, I’d go with the AL39 and R92. Both microphones impress me more with each listen; whenever I solo one of them, I think Right, that’s what alto sax is supposed to sound like. Kudos to Samar Audio and AEA. The audio clips above are MP3s. The format provides a useful balance between sound quality and convenience of playback. If you’d like to listen in higher resolution, download the PT9 session here (128MB, *.zip). If you’re not a Pro Tools user, you can still use the above-linked session file; just open the “Audio Files” subfolder of the session folder. Drag them into your DAW of choice. The session contains 12-inch and 18-inch tracks for all these ribbons, plus the U87 paired with each ribbon, at 24/48 quality. “F12-U87-Seville.wav” is the U87 during the Seville test, at a working distance of 12 inches. “F18-R101R.wav” is the Rear side of the R-101, at a working distance of 18 inches. Hearty thanks to John Patrick Douglas for his great chops and tone. 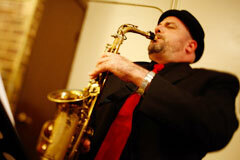 If you’re looking for a sax or flute player (or instructor) in the SF Bay Area, check out John’s site. Be sure to tune in for future installments of this extensive ribbon mic review; see the TOC below. Well done test. The alto player’s sound is so bright (likely due to the choice of a fairly hard synthetic reed) that it definitely benefits from the darker sounding ribbon mics vs LDC. A player with a more traditional jazz alto saxophone tone would sound perfectly fine on the U87. That said, I’m definitely interested in a few of these ribbon mics, particularly one of the active ones like the N22. Thanks for doing this test… very interesting. I have often felt that in today’s digital world, the 87ai is too bright and nasal sounding (confirmed most recently on a recording that I did for an Italian artist using my 1959 Selmer MKVI with Otto Link EB 7… still, requiring a touch of eq to be fine). I agree with the other reviewer that more traditional setups such as Meyer, Link, Selmer, would have fared better in that harsh upper mid terrain you talk about. The reason being the raised floor and baffles of some mouthpieces implemented to help some players project a little farther. Also, whatever is gained with the synthetic reed is questionable when compared to the comparatively sweeter sound of a cane reed. Of course this is all just to say that all of these elements play a part in our sounds, so… Kudos for including this information! I appreciate the quest to find a microphone that accurately represents our saxophone sounds, and for me that usually translates to the flattest frequency response. The same care that we take finding our voice on an instrument needs to be addressed in the accurate documentation of that voice and it’s application in whatever musical setting in which we find ourselves. So, it would be interesting to include the artists favorite choice in the final analysis. FWIW… my faves are the Neumann U67, AEA R44, (which I don’t own) and AKG 414 BULS and EB, AEA R84, Royer SF12, (which I do own). For the purposes of this article, I paid $450 to $500 for each AKG and $750 for the R84, bring them in under the $1K mark. Personally, I’m still looking for that really flat frequency response ribbon mic with the robust spl ability of the R121, with a flatter response than the SF12 and the magic of the R44!